Species belonging to the family of elephants, named by Matschie, 1900. 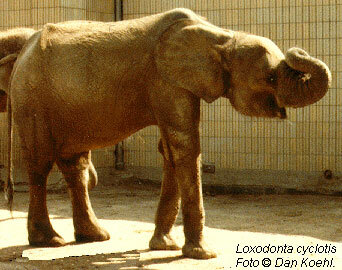 African forest elephant Dima in Frankfurt Zoo, Germany, 1976. The African forest elephant was a subspecies - (Loxodonta africana cyclotis) - from the African elephant (Loxodonta africana) but is - or may may be soon - upgraded to a species on its own, Loxodonta cyclotis. The African forest elephant has like the asian elephant four nails on the hindfeet and five nails on the frontfeet (which is more nails than than the african bush elephant (four front nails and three nails on the hind feet). It has also more rounded ears, which may meet above the shoulders. The tusk of the is also straight and points down, and smaller and thinner than those of the african bush elephant. The forest elephant has been researched by the zoologist Andrea Turkalo, who since the late 80�s has studied 2500 elelephants at Dzanga Bai in the National park Dzanga-Ndoki in the republic of Central africa. 1980 there was estimated 380 000 forest elephants, since then the human population was doubled in the forested countries, and today theres probably less than 200 000. In december 2000 formed the environmental ministers in Camerun, Centralafrican Republic and Congo, a united migration corridor for the elephants, where they can walk hence and forth over the borders between the countries. Abstract: "The shoulder height of 53 identified elephants was measured using photogrammetric methods. The minimum estimated shoulder height was 69 cm from a young calf, and the tallest animal was 216 cm. Hind footprint length and boli diameter data were collected from unidentified individuals. The minimum footprint size was 12.5 cm and the largest 35.3 cm. Boli diameter ranged from 4.0 to 16.0 cm. A comparison of the size categories with those of savanna elephants in Amboseli National Park, Kenya, suggested a similar distribution of size, age and population structure, despite a marked difference in overall stature. 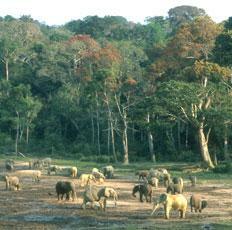 These are the first data for measures of African forest elephant size compared to African savanna elephant size. Such data may add morphological evidence supporting recent genetic work suggesting that African forest elephants be re-classified as a distinct species from the African savanna elephant".